Real Madrid have won a small victory in their dispute with FIFA over the illegal signing of under-age foreigners after the Court of Arbitration for Sport (CAS) temporarily lifted its ban on appeal. The decision means eight players, including French coach Zinedine Zidane's sons Theo and Elyaz, can play for their respective youth teams until the appeal decision is made. "The Court of Arbitration for Sport has granted the precautionary measures that Real Madrid appealed for following the sanction issued by FIFA," said a statement issued by the European champions on Friday. The CAS, sport's highest tribunal, has never overturned a transfer ban from soccer's ruling body FIFA on the signing of minors. FIFA has not disclosed the names of the 39 players originally investigated but Real director general Jose Angel Sanchez said they included Zidane's four sons. Theo, 14, and Elyaz, 11, represent Real's youth teams while Enzo, 21, and Luca, 18, play for the club's reserve side Castilla in Spanish football's third tier. 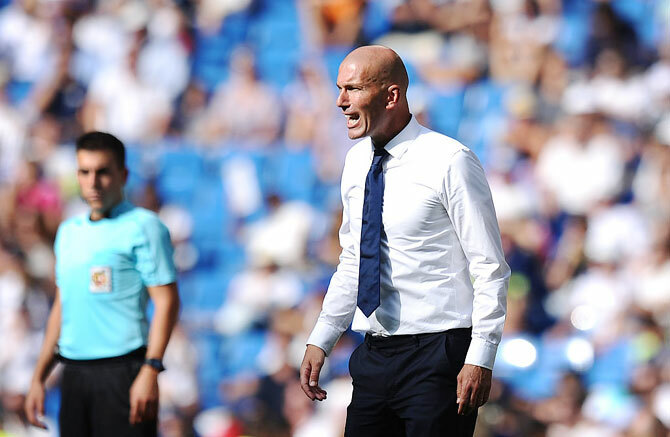 FIFA has reduced the number of players investigated to eight, leaving out Enzo and Luca among others and Morocco international Achraf Hakimi who had been prohibited from playing for Castilla. Earlier this month Real and Atletico Madrid lost their appeals against transfer bans imposed for breaching rules on signing non-Spanish under-18 players. Real are still banned from registering new signings in any age group until January 2018.